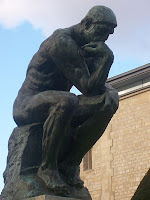 The Relationship People's Blog: Are you an Inside or Outside thinker? Did you know there are people who do this differently from you? When we do things in the same way as our partner communication happens. It's only when we are very different that communication becomes a challenge. This also offers the opportunity for widening our style of thinking and style of communicating. When taking on a new project at work or at home do you like to talk through the information and 'see' what you think about it? Or - Do you need some time to quietly mull it over before telling others what you have come up with? If your answer was something along the lines of - "I like to talk over the information, run a few thoughts up the flagpole, I don't always know what I think until I start to say it, as my thoughts take shape in front of me I can sort out the good ones from the bad." And more in that sort of vein - then you probably prefer to think 'outside'. If your answer was - "Mmmm! Let me think about that." - then you probably prefer to think 'inside'. I use the word 'probably' because many people do both and this can be context sensitive. So you may think outside at work and inside at home, or vice versa. Think inside when faced with a problem, think outside when putting the world to rights with friends, or vice versa! The important thing is to begin to notice if you have a preference, and then if your partner, friends, children, parents or work colleagues appear to have a different preference. When you use the same inside or outside pattern with someone else, then communication is easy. It becomes more of a challenge when your preferred styles are opposite! Jenny is by preference an outside thinker, I am by preference an inside thinker. Whilst John Gray in 'Men are from Mars, Women are from Venus' might suggest this is a gender pattern with 'men going into their cave', we have found examples of both genders using either style. It is too easy to 'label' ourselves and thereby limit our opportunity for flexibility. There are plenty of other people attempting to 'keep us in our place' or put us in a box, so they 'know' us better. I have no plans to go into a box until I'm good a ready for it! How does this work, or rather not work for us? When considering something in our business Jenny will ask if we can take a moment to discuss it. Because she is by preference, in this example, an outside thinker, she will begin to talk about her thoughts. This allows her to see what she is thinking, explore ideas and possibilities, some of which are dismissed half formed or incomplete and generally talk at about a million miles an hour! (My perspective). If you are an outside thinker, you will be saying to yourself, or possibly out loud to the dog, cat, computer screen or friend, "Yes! That's perfectly normal." If like me, you are by preference an inside thinker, then also like me, you are probably wondering when she will stop talking because all this noise makes it impossible to think straight. I just think I have understood one of her ideas when she then decides it's no longer any use and off she goes on another one. It's enough to give me a headache! To make matters worse, when she has done this for a while and, for her, got some clarity about her thoughts she asks me the question I most dread. "What do you think?" At this point I need to go inside and find out what I do think, which might take a moment or two. Usually a moment or two too long for my outside thinking wife, who needs my input to set her off again on the next round of half formed thoughts and ideas. She is therefore needing me to respond quickly to keep her creative juices flowing and I need her to be quiet for long enough to get my brain in gear and consider the matter. At this point communication is in danger of collapsing. Jenny accuses me of not being interested, and I become tetchy and irritable because my thoughts are in a complete jumble and I need a bit of peace and quiet! Sometimes I get it into my head to think about something new. I mull it over, mentally rehearse how I'm going to explain it or write it, and come up with the perfect finished project. Then I say to Jenny, "I've got an idea!" As I explain it, and foolishly pause for breath, Jenny takes the opportunity to come in with her own thoughts. It seems like she's dissecting my brand new shiny idea and coming up with reasons why it won't work, or could work better if done differently. She is thinking outside about my carefully constructed inside thoughts, which incidentally I'm only half way or less through explaining! I again become tetchy, (I'm good at this) and so on this occaision does Jenny, because I keep telling her to wait until I've finished, which effectively disables her from thinking about what I'm saying. Another communication hiccup. If you and your significant other both think in the same way, you could be laughing at the mess we are in. If however any of this sounds all too horribly familiar to you in your relationship, or with someone else in your circle of acquaintance, then read on to find out some ways to deal with this. Notice your own patterns first. The first and most important thing to do is notice your own patterns. Then acknowledge and appreciate your partner's patterns. Both ways of thinking have merit and neither is intrinsically wrong or right. It's really useful to develop a flexible approach and become proficient at both ways of thinking. Avoid putting yourself in a box, out of which you can't move. "I was like this when you married me, why do you expect me to change now?" Since working together we have become even more aware of our different preferences. For most of our married life together we worked in different places, where our thinking style matched our work: Jenny worked in a large organisation in a shared office, I worked by myself, at home, quietly. Now we have to pay attention to how we value our different styles. When Jenny wants to talk things through and explore her thoughts out loud and outside, she says to me "I just want to talk about some thoughts I've had. I'm not wedded to these, but I need to explore them." I then know I need to give her the time to do this and not interupt the flow. When she asks for my input I either ask for a bit of time to consider it or join in the outside thinking by prefacing my next remarks with "well let me think out loud for a moment and see what comes up." That deals with scenario number one. To avoid my wonderful ideas being shot down in flames after hours of careful consideration and planning, I now know it's better to do a bit of inside thinking and then share what I've got so far with Jenny and indulge in a bit of outside thinking together, before I go back inside to consider the new information now available. "Ha!" You might say, Nigel is doing all the flexing here! Not so. Jenny is capable of inside thinking, by thinking outside, but quietly to herself. Also, when she is typing into her computer she thinks outside through her fingers on the keyboard and sees what she is thinking appear on the screen. When I am typing into the other computer, lost in my thoughts and not keen to be interupted for a quick chat about something Jenny is doing now this moment, she knows to wait for a natural break and then check whether I'm up for a chat about that something. Even deep inside thinkers come outside eventually! Now when we chat about different options we know the importance of being clear whether we're talking about a firm proposal or the beginnings of an idea! Jenny and I have many things in common. This experience reminds us how to also value our differences. Even if I was the one doing the flexing, the greatest benefit is to me. I am becoming comfortable thinking inside and outside. Practise makes perfect, as I can demonstrate with my skill of tetchiness. If this seems like Baloo the bear, in the Disney film of 'The Jungle Book', giving Mowgli advice on how to eat a prickly pear, well I hope I've given you a clue!! What do you and your partner do? Do you think differently? Have you evolved your own cunning strategies for valuing your strengths? Please email me your thoughts, either immediately or after due consideration.